This savoury gluten free bread is my answer to those cheese and bacon rolls you get from the supermarket or most bakeries. It’s additive, preservative and sugar free. Best of all it’s delicious, as well as much more nutritious. Toast it, spread with avocado, top it with baby spinach and a poached egg and you have cafe worthy breakfast for a smidge of the price. Or if you’re in a real hurry, cut it thicker, toast it and spread it with avocado – it’s very filling. You can also pop it in the lunchbox with some butter, or you could even fill it like a sandwich. I prepare this ahead and freeze it, so it’s super easy to grab out for breakfast or the lunchbox. * If you need a nut free version, remove the LSA, increase the self raising flour by 1/4 cup, and add in 1/4 cup of sunflower and linseed meal (you may need to mill this mix yourself). Allow to cool in pan for 15 minutes, then turn out onto a wire rack. Slice when cooled. 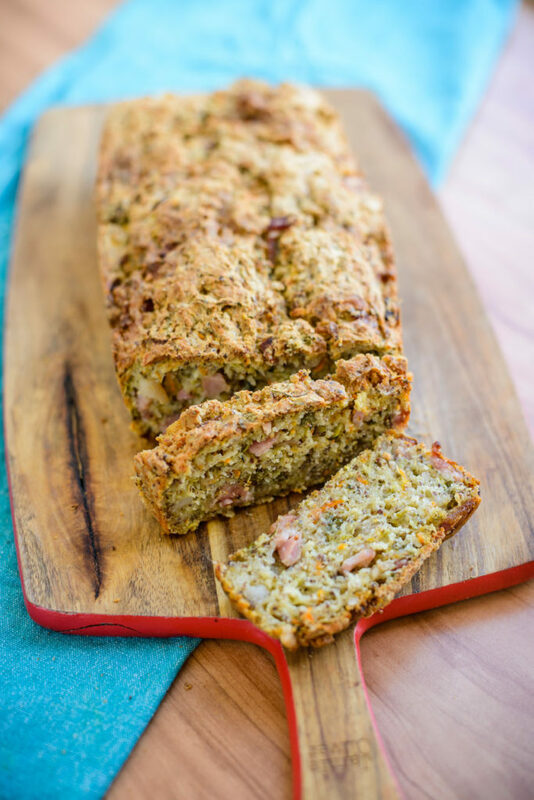 Remove the bacon and just leave this as a savoury vegetable bread. Add a good sprinkling of herbamare for extra seasoning. Add in sun dried tomatoes and diced olives. Slice the bread, then freeze it in portions of 2. To ensure the 2 pieces can be easily separated, you can pop a piece of baking paper in between them. Store them in bags like these litter free living clear bags to save $ and the environment. We met a family at a caravan park we were staying at. Their kids loved those cheese and bacon rolls from a chain bakery. We are not coeliac but we choose not to have gluten because it affects both Israel and Indrani’s moods. This however did not stop our kids from nagging me to buy some of these cheese and bacon rolls – because it’s not fair! Rather than succumb and buy them, I decided to make my own more nutritious cheese and bacon rolls which would be gluten free. In the bus, I don’t have the equipment to make rolls, so I made this firstly into muffins. Indrani upon tasting said “This would be better as a bread, Mum.” So after a few days when the muffins were gone, I tweaked the recipe a little and turned it into this bread recipe. And there was much rejoicing – mine and there’s – the recipe was a winner!